Please see details of the first Passengerfilms event of 2016. We are trying out a great new venue – the lovely Paragon Bar at the Genesis Cinema in Whitechapel – so a reassuring smattering of LS faces in the crowd would be wonderful! And please bring along any other interested parties you can think of. Ella and Mel from Precarious Geographies are hosting, with Oli Mould and Will Davies (Goldsmiths) on the panel discussing NIGHTCRAWLER. There is a bar throughout (amazing cocktails) and food available too. Join us on Tuesday 19th of January for a screening and exploration of Dan Gilroy’s fascinating film ‘Nightcrawler’ presented by Passengerfilms in collaboration with ‘Precarious Geographies’ and Genesis Cinema. “Stress: Approaches to the First World War” is an interdisciplinary, cross-collection exhibition curated by six PhD students at University College London which seeks to explore the effects the war had on minds, bodies, the landscape, and culture. On display in UCL’s North Lodge until the 20th of November, overlooked by the University’s monumental portico, this unique examination of the First World War includes objects as diverse as Magic Lantern Slides from Francis Galton’s eugenics laboratory to a preserved coal miner’s lung and from UCL’s pathology collection. At lunchtime on the 11th of November four of the exhibition’s curators are staging a special event in UCL’s Art Museum to mark Remembrance Day. Each curator will give a short, informal presentation on how their research at UCL connects with the exhibition and provides novel perspectives on the First World War and its legacy, followed by questions and discussion with the audience. These presentations will cover a varied and singular range of themes including masculinity and the First World War; literature, trauma, and remembrance; the forgotten dead and human remains; and the staging of war in Greek drama. Attendees will then be invited for refreshments in UCL’s South Cloisters where they can continue the discussion with the curators and visit the exhibition itself. This is a free event and is open to all. However, booking is required and places are limited. I have recently started a research blog which I have called Linguistic Geographies. I’ve been meaning to do it for a while, but some comments I received after the Landscape Surgery first year presentations last week spurred me into action, and already the act of creating my own small space on the world wide web has thrown up an interesting conundrum: how do you get your site indexed by Google without actually signing up to/in to Google? Much of my research involves being as ‘clean’ of what I might start calling ‘google residue’ as I can, and for that reason I don’t have a Gmail account or signed in searches. I have experimented with Google Adwords, but keep that to my laptop, leaving my desktop as ‘google neutral’ as possible. But resisting the charmingly convenient yet data hungry ministrations of the googlebots is proving an existential challenge. I can’t ‘submit my URL’ to Google, or use any analytical or webmaster tools without creating an account, and as result of this, the google spiders are steadfastly refusing to crawl in my direction. A Google search on Linguistic Geographies currently only returns several references to Linguistics projects relating to the geographies of language and dialect, and does not yet pick up on my blog, despite it being a link-heavy WordPress site. I’m going to be patient and leave it for a while and see what happens. I know page rankings on Google are measured in part by the outgoing and incoming links between pages, so I will try to establish my presence that way. In the meantime, I am happy to exist in the realms of the blogosphere and hopefully the other search engines which don’t force me to give up my data in return for a web presence. I will keep an eye on the search results, and will perhaps be able to work out what it is that finally prompts the googlebots to stop ignoring me, if they ever do, that is. Wish me luck (and links)! On Tuesday I had the fantastic opportunity of presenting my research on algorithms and language to Landscape Surgery. I also received some incredibly useful, far-reaching and challenging feedback on the draft of my paper ‘Language in the Age of Algorithmic Reproduction’. I learnt so much from the session, and am currently re-working the paper in order to present at Prof. Louise Amoore and Dr Volha Piotukh’s ‘Thinking with Algorithms: Cognition and Computation in the work of N. Katherine Hayles’ workshop at Durham later this month. I have so much to think about from the LS session, but the main realisation for me is that for this paper at least I need to focus less specifically on search algorithms and start looking further into how language is also affected by things like plagiarism software, keywords and firewalls. Also in terms of my wider thesis, I really need to work on my methodology to try and measure some of the things that concern me, perhaps by looking deeper into Search Engine Optimisation, Google as ‘curator of knowledge’, and the materialities, practices and ethnographies of the processing of words through computers. Using Walter Benjamin’s seminal essay The Work of Art in the Age of Mechanical Reproduction (1936) as inspiration, contrast and critical framework, this paper seeks to examine what happens to writing, language and meaning when processed by algorithm, and in particular, when reproduced through search engines such as Google. Reflecting both the political and economic frame through which Benjamin examined the work of art, as mechanical reproduction abstracted it further and further away from its original ‘essence’, the processing of language through the search engine is similarly based on the distancing and decontextualization of ‘natural’ language from its source. While all algorithms are necessarily tainted with the residue of their creators, the data on which search algorithms can work is also not necessarily geographically or socially representative and can be ‘disciplined’ (Kitchin & Dodge, 2011) by encoding and categorisation, meaning that what comes out of the search engine is not necessarily an accurate (or entirely innocent) reflection of ‘society’. Added to, and inseparable from these technologically influencing factors, is the underlying and pervasive power of commerce and advertising. When a search engine is fundamentally linked to the market, the words on and through which it acts become commodities, stripped of material meaning, and moulded by the potentially corrupting and linguistically irreverent laws of ‘semantic capitalism’ (Feuz, Fuller & Stalder, 2011), and “by third parties in the pursuit of gain” (Benjamin). With the now near total ubiquity of the search engine (and particularly monopoly holders Google) as a means of extracting information in linguistic form, the algorithms which return search results and auto-predict our thoughts have a uniquely powerful and exponentially increasing agency in the production of knowledge. So as “writing yields to flickering signifiers underwritten by binary digits” (Hayles, 1999), this paper will question what is gained and what is lost when we entrust language, knowledge and the interpretation of meaning to search engines, and will suggest that the algorithmic processing of data based on contingent input, commercial bias and unregulated black-boxed technologies is not only reducing and recoding natural language, but that this ‘reconstruction’ of language has far-reaching societal and political consequences, re-introducing underlying binaries of power to both people and places. 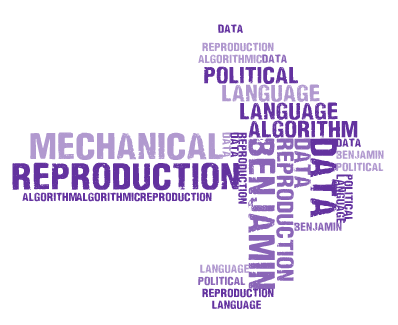 Just as mechanical reproduction ‘emancipated’ art from its purely ritualistic function, the algorithmic reproduction of language is an overtly political process. Many thanks to all who came and contributed on Tuesday!